There’s more to the Los Angeles beachfront than sunbathing at Venice Beach, surfing in Malibu, and living it up in Santa Monica. 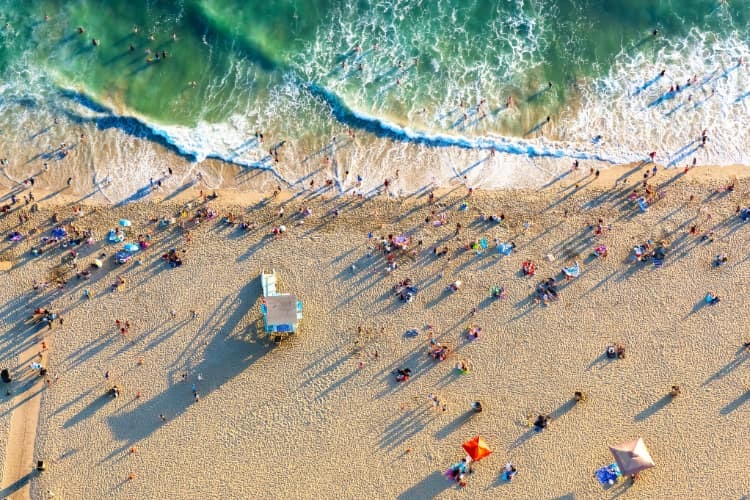 For those who want to enjoy the waves away from the crowds and normal tour groups, LA has plenty of other destinations for local beachgoers and out-of-towners alike. Whether you’re planning the perfect beachside wedding, a corporate retreat along the shore, or a simple outing for your family, we can help. Los Angeles Charter Bus Company services events and getaways of all kinds, from Thousand Oaks to Long Beach and everywhere in between. Call our 24/7 team at 310-667-6197 today for a free, personalized quote! Not sure where to start? Here’s some of Los Angeles’ lesser-known beach attractions, so you can hit the beach like a local. 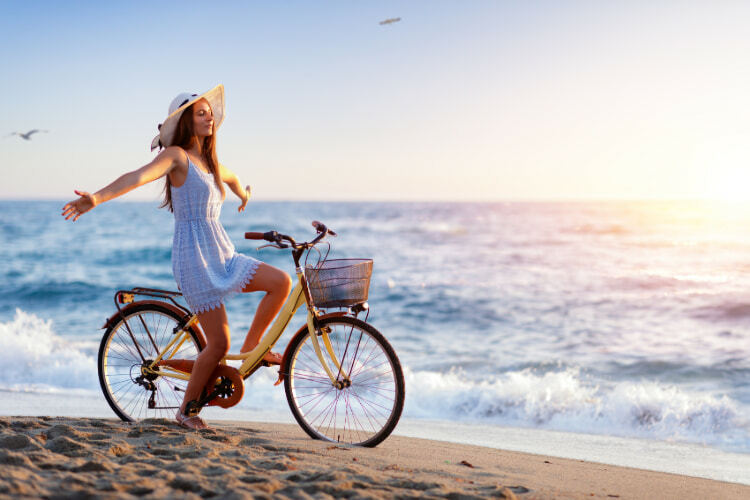 One of the best ways to explore LA’s shoreline is a leisurely bike ride along the coast. Pedal-pushers can take the Marvin Braude Trail southward, under the palm trees at the edge of the Manhattan Beach sand, down to Hermosa and Redondo Beaches via The Strand. These combined trails stretch along 5 miles of LA coastline, so rent a bike lock and plan rest stops along the way. Break for a quick volleyball match in Manhattan, take a stroll down Hermosa Beach Pier, or check out local goods at the Redondo Beach Farmers Market. Each town along these trails has a unique personality, so your group should schedule plenty of time to explore these beachfront communities at your own pace. After a day of biking, you and your friends will not want to make the round-trip back to your cars. Even worse, finding an affordable rideshare with enough space to accommodate everyone and their bikes can be tedious. Instead, have a personal, professional driver handle transportation to and from the trails with a bus rental plan through Los Angeles Charter Bus. Your driver can drop off your biker gang at the El Porto trailhead and pick everyone up at Veterans Park in Redondo. Planning a bus rental beforehand not only secures a predictable transportation price point, but it also allows your group the freedom to create your own itinerary with a reliable ride home. Considered one of the most scenic bouldering spots near Los Angeles, Corona Del Mar is the perfect destination for climbers seeking sun, sand, and surf. This beach offers challenging routes around sandstone precipices, with plenty of ocean views to enjoy between climbs. The soft sand provides great cushioning for falls from fun, shorter climbs, but if your team of adventurers decides to attempt the strenuous 20-foot highballs, a crash pad is recommended. Make sure to pack all your climbing essentials before the hour-long drive from downtown LA. Luckily, buses in our network include roomy luggage bays and spacious overhead storage compartments, so your group will have plenty of room to comfortably store your equipment, coolers, and a picnic lunch. Looking to sunbathe away from the salt water? Take a day trip to the family-friendly local hangout, Castaic Lake. This reservoir technically includes two bodies of water: Upper Lake, which is a favorite for sailors, power boaters, and water skiers, and the laidback Lower Lake. Swimming season on Lower Lake Beach runs from mid-May to mid-September, but the calm waters and scenic views make this lake perfect for canoeing, fishing, and relaxing on the waterfront year-round. The ride to Castaic Lake can be a bit of a long-haul, so ensure everyone’s comfort along the way with the right ride plan for your group. We charter buses in a variety of sizes, from 18-passenger minibuses to 56-passenger charter buses, so we can connect you with the perfect bus or combination of buses to comfortably transport everyone. With amenities like WiFi, power outlets, plush reclining seats, televisions with DVD players, and much more, everyone is such to arrive comfortably and ready for a day out on the water. After a long day of LA sightseeing, cozy up to the fire with a toasted marshmallow at Dockweiler State Beach. This Playa del Rey beach is the only place to legally have a bonfire on the beach in Los Angeles County, and the shoreline has dozens of fire pits where residents and tourist alike love to gather. Get there early in the day to secure a ring, and be sure to bring plenty of wood, food, drinks, and entertainment to last you well past sunset. Be on the lookout for hang gliders and planes taking off from nearby LAX. Although beach admission is free, parking costs between $3 and $13 during the summer. 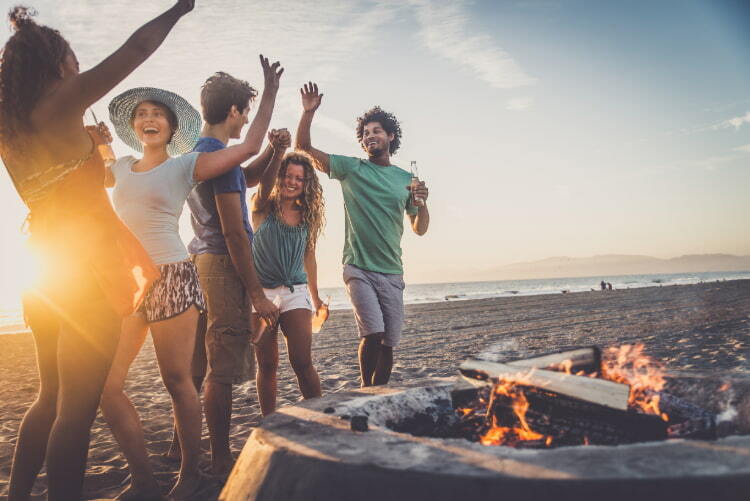 When you rent a private shuttle from Los Angeles Charter Bus Company, your expert driver will handle all the travel logistics for you so you can focus on making the most of your memorable beachfront bonfire. Ready to book? Our reservation specialists are available around the clock to assist you with your LA transportation arrangements when you call 310-667-6197. We will tailor your rental plan to your needs and itinerary, so you can enjoy without sweating the travel details. Let the professionals take the wheel, and go soak up the sun!